Posted by grhomeboy in Archaeology Greece, Arts Museums. 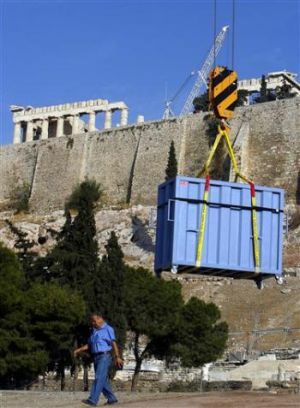 A container with ancient artifacts inside is lowered from the Acropolis yesterday at the start of the process to transfer more than 4,000 antiquities from the Sacred Hill to the new Acropolis Museum some 400 meters away using three giant cranes. 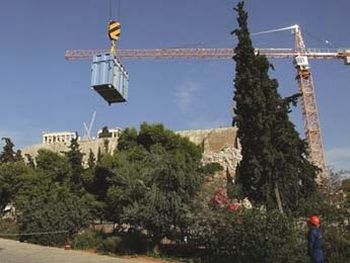 The beginning of the historic operation was watched by hundreds of onlookers, including protesters who want the government to halt plans to knock down two listed buildings that are partially blocking the view of the Parthenon from the new Acropolis Museum, which is due to fully open to the public late next year. 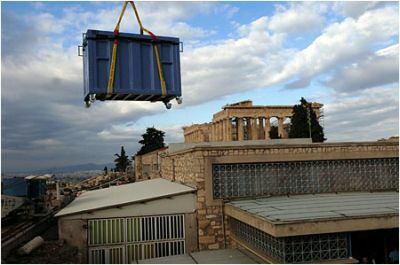 Transfer of artifacts begins tomorrow > The transfer of antiquities from the old Acropolis to the new Acropolis Museum is set to begin tomorrow in an operation involving three giant cranes that will be used to transport thousands of artifacts. The museum is expected to be fully open to the public by the end of next year. It’s amply lit, spacious and brand new. But its greatest asset will be over two-and-a-half millennia old. The glass-and-marble purpose-built Acropolis Museum will tomorrow welcome the first of over 4,000 ancient treasures currently waiting in its cramped precursor on the hilltop in the heart of the city. Following a successful dress rehearsal in front of dozens of anxious pairs of eyes earlier this week, a team of experts is ready to transfer a 2.5-ton marble sculpture, part of a frieze depicting a religious procession honoring Athena, the divine guardian of the ancient city. Officials certainly hope they have the gods, as well as the weather, on their side. Save some heavy rain and strong winds or some technical snag, the transplant should be completed in six weeks’ time. Costs will hover at 1.6 million euros ($2.2 million), while the priceless antiquities have been insured for 400 million euros ($566 million). The artifacts will be ferried by a crane relay in what will be a meticulous and delicate process. Three 50-meter-tall cranes have been installed between the ancient temple and the new museum. 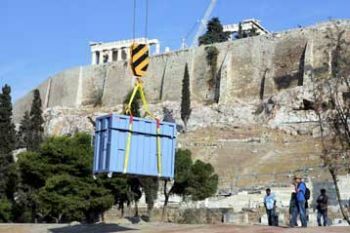 Archaeologists and engineers will hold their breath as the carefully packed masterpieces will soar over the 5th century BC Theater of Dionysos before landing at their new home, which will open its doors in stages, beginning next year. The modern structure looks like a big spaceship parked on top of the crammed Makriyianni district. Designed by the US-based Bernard Tschumi, it is one of the rare examples of monumental architecture in Greece. And, like most big architecture, it has not been without controversy. Even before the design emerged, there were doubts about the selected spot. The truth is that the decision to have a museum facing the ancient monument came with a hefty price. The building seems to be struggling for space, squeezed as it is within a sea of ugly concrete apartment buildings spread along the southern foot of the hill, as well as the heritage-listed Weiler Building. Some blocks of flats were actually razed to make room for the gigantic newcomer, often prompting charges of dubious expropriation procedures from the exiled inhabitants. But no issue stirs greater controversy than the planned demolition of two listed buildings next to the entrance of the new Museum, a 1930s art deco structure and a neoclassic house, the property of Oscar-winning composer Vangelis Papathanassiou. The two buildings block the view to the Parthenon from the lower floors of the new Museum and the government insists that they must come down. Critics say the Museum is too modern and out of tune with the trademark classical style of its impending collection. «The building doesn’t suit its surroundings. It’s ugly, out of place and extremely anti-ecological,» said Christina Karanatsi, who lives in the neighborhood. She fears that the the extensive glass surface implies a power-hungry building that will have a dire impact on the microclimate of the area. The renowned architect has rejected criticism, at least the aesthetic side of it. «Some people have said it is disrespectful to the Parthenon not to have Doric columns, but I am not interested in imitating the Parthenon,» Tschumi has said, adding that his aim was for modern architecture to match its perfection in its own way. Others say it’s a beautiful building, expressing the view that the customarily skeptical public will eventually come to embrace the museum. «Greeks are always like that. They never like anything new. But with time, the design will grow on them. I personally think it’s a great building,» said a worker at the site. Only a few people have had a chance to check out the interior, but those who have agree it is imposing and aesthetically pleasing. Its 20,000 square meters (215,000 square feet) are spread over three levels. The ground floor hovers above the archaeological remains of the ancient neighborhood unearthed during construction. Extensive use of glass flooring incorporates the finds into the museum structure in a near-dizzying effect. The ground level is set to host temporary exhibitions and artifacts retrieved from the surrounding area. 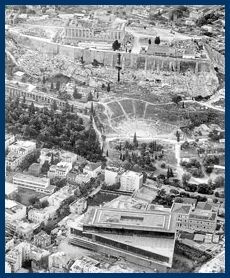 The first floor will host the Archaic and Roman galleries, while a bar and restaurant with a great view of the Acropolis will serve visitors on the mezzanine. The most hyped hall of the museum however is the Parthenon Gallery, sitting on top of the building. A rectangular glass gallery will showcase the temple’s marbles, replicating their exact size and orientation. Visitors will get to see the items as they originally appeared. But not all of them will be here. Copies of the friezes will be on display behind a symbolic, transparent veil in the place of those showcased at the British Museum in London. The artifacts, also known as the Parthenon Marbles, were removed in the early 19th century by the Scottish diplomat Lord Elgin when Greece was still under Ottoman occupation. Persistent calls for their repatriation since the early 1980s have fallen on deaf ears. Officials hope that the new Museum will help heighten the pressure on Britain to return the marbles, as one of the central arguments for their keeping them hostage, namely superior exposure, has been put to rest. «We are all obliged to intensify our efforts for the return of the Parthenon Marbles from the British Museum because only then will we have fulfilled our historic duty,» Culture Minister Michalis Liapis said after the test run.